What better way to jump back into blogging than with some current favourites? I haven't disclosed too many products here (I thinking about getting back into monthly favourites), but I have been solidly using and loving these products for the last few months. Starting with makeup, I've been using the Everyday Minerals Matte Base almost every day since I got it and I've actually nearly used it up already. I was recommended this by the lovely Sarah after I declared to stop using Alima Pure after discovering that they used carmine - something than I despise and seemed to have missed beforehand. And I'll be honest, I do really see much difference between the two products. The shade ranges are very similar, and the formula also seems to work in a very similar way on my skin. You may need to use a bit more of the EM foundation but I can still get a medium coverage that looks natural and skin-like. As mentioned, I am nearly out of this and so it definitely didn't last as long as the Alima but that's a compromise I am willing to make in order to support a 100% vegan company over one that uses such a barbaric ingredient. Everyday Minerals is also a great deal cheaper. You can either get it from Cocktail Cosmetics in the UK or (for an even bigger saving), ship it from iHerb. The PHB Ethical Beauty Natural Mascara* is something I have mentioned before but a while ago they went through a particularly disastrous repackaging which left the mascara almost unusable. I am happy to report that we have now returned to the old packaging and the product is now back to its former glory. I always recommend this to people who are used to conventional mascaras as it is the most volumising natural mascara I have tried and it also has a similar price point to high street options. I've also been loving my essential oil diffuser recently. Mine is just a random cheap brand one from Amazon but I really like the faux wood detailing. You can also change the colour of the light and the timing of the mist. I've been using it alongside some blends from Tisserand and my favourite has been the Winter Warming Blend, perfect for this season. 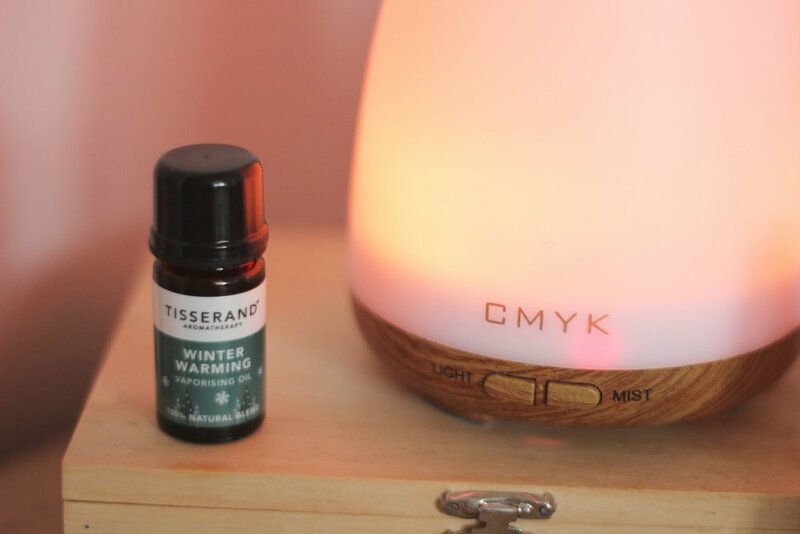 This blend uses eucalyptus, clove, and rosemary and although not traditionally 'Christmassy,' definitely makes you feel all cosy and in the winter spirit. And of course, no favourites would be complete without some Isla Apothecary. I've been trying a good variety of Isla's products and the Immortelle Scar & Blemish Oil* has to be one of my top picks. I am sceptical of any product that claims to fade scars but I find this to be a really nice facial oil for oily/acneic skins and despite the slightly odd smell (similar to tobacco), I really enjoy using it. It's not too heavy, but still leaves my skin moisturised and glowing while helping to take down the redness and inflammation that comes with acne. If you're interested in either the Isla oil or PHB mascara, Lovelula currently have a Black Friday promo on and you can save 15% with the code FRIDAY until 2nd December! 2. H&M Conscious Beauty... To Buy, or Not To Buy? And of course, now on to the part we've all been waiting for, my top green/natural/vegan beauty picks of 2016! Despite being the only non-natural product on my list, the Bravura salicylic acid peel has probably made the biggest impression on my 2016 skincare routine. I have been struggling with closed comedones on my cheeks and jawline for the last two years and this product seems to be one of the only things that keeps them at bay. Natural sources of salicylic acid (like willow tree bark) were, in the beginning, no where near strong enough for my acneic skin. So, this gem has really made a difference and I am finding myself relying on it less and less - definitely making it one of my top skincare products of 2016. I was lucky enough to receive this as a Christmas gift from Skin & Tonic in 2015 and I have been loving it ever since. It's a wonderful gentle - but potent - mask with a coconut milk powder base that makes it perfect for a little face mask alchemy. I love mixing this with a brightening face oil and rosewater. I waxed lyrical about this product in a full review so I won't harp on too much but this is pretty much the only water-based moisturisier I can use on my face. I find most to be too heavy, but this is perfectly nourishing while still feeling light. I definitely prefer to use face oils but I occasionally follow with this when my skin is really dehydrated. It's also great under makeup as it dries to a relatively matte finish. To be honest, the entire Brija Cosmetics makeup line blew me away in 2016 but my favourite products have to be the matte eyeshadows, inspired by Gilmore Girls. Brianna has the greatest range of colours and every shade blends beautifully. If you're struggling with finding good natural matte eyeshadows, then I urge you to try Brija. Trust me, the loose formulation and ordering from the US is worth it. I'll be doing some swatches soon! I was gifted this cleansing oil at Gorgeously Green Gathering this year and I really do love it. I generally prefer lighter cleansing oils (like my beloved Vedani Botanicals) and this option fits the bill perfectly. I find it works quite similarly to the Vedani and so I didn't feel the need to include both on this list (and I don't have a bottle of the Vedani at the moment) but definitely check them both out. I've already done a full review of the Vedani and have a review for Mallow & White coming very soon in 2017. This is 100% not a new product for me, but it's one that I have got some serious use out of in 2016. With my heightening use of acid products this year, my skin has occasionally looked a bit flaky. This is quickly remedied by Pai's wonderful exfoliator, a brilliant hybrid of physical and enzymatic exfoliants. I love using this in the shower (it can be a bit messy otherwise), and I'm not looking forward to it running out - which will probably be very soon. I finally found the perfect vegan liquid eyeliner in 2016 in the form of Zuzu Luxe's Liquid Eyeliner in Raven. It's super popular in the US green beauty community and recently became available in the UK from Amazon. I was quick to try it and very quickly impressed. It's super easy for me to apply as the applicator is very similar to one I used in my teens, and it doesn't smudge too bad on me either. I'm currently loving a liquid eyeliner from Colorisi but this is the baby that saw me through 90% of the year. This needs no introduction as my review actually made my most popular blog post of 2016. I've only ever tried two scents in this deodorant (the bergamot and lime being my favourite) so I can't speak for the whole line, but Schmidt's seems to be the only natural deodorant that has so far worked for me. They recently brought out a baking soda free version that I am super excited about (as I do get a little irritation these days) and I'm excited to try that one next. What are your top five products for 2016? I would love to know! Woohoo! I uploaded my first YouTube video in EIGHT MONTHS. Hopefully I'll have some time to do these things more often now that uni is letting up for summer. Watch above for a wrap-up of my five favourite books and five favourite beauty/lifestyle things from April! June Favourites - and YouTube! So I'm on Youtube! You can watch my first video above, where I'm talking about my June Favourites. I've never really been a 'monthly faves' type gal, I'm more of a talk-about-my-loves-all-the-time blogger. You may have noticed. From today onwards, monthly favourites are going to be exclusive to my channel so get subbin'. I'm still getting used to talking to the camera, filming with a DSLR and editing. My current laptop situation isn't too great either so I'm doing what I can! I'm hopefully purchasing a Macbook Pro next month so there will be lots of shiny new posts, videos and content to look forward to. Let me know what you think and leave me some video suggestions below! P.S. It's my practical driving test today. Eeek.